Raghu puts divorce papers in mandir and says Dhanak signed them and you made her do it, she accepted our relation, I will pacify her. Batli asks whats the plan? Raghu says I have to make her mine. Aslam says sings with him. In morning, people are waiting for washroom. Dhanak comes there. All try to give her space as she is Mai’s daughter in law. Dhanak says I can wait, woman says no Mai will be angry. Dhanak says I am against her and wont let others do this, who comes first will go first, Mai will wait too. Woman says dont mess with her. Dhanak says now I cant move back. Mai comes there and tries to cross line but Dhanak stops her. Raghu comes to Mahindra’s house. Parag asks them to leave. Raghu says dont be angry, I am here to invite for my wedding reception. Mahindra slaps him. Dhanak asks Mai to stand in line. Mai says you are politician now? Dhanak says I wont let you go. Mai says you think you are owner of this chawl now? I am not standing in line, you dont know about my power, she goes in washroom. Woman says I told you its not worth it. Raghu says to Mahindra that you are my papa so you can beat me, Mahindra says my daughter will never be with a goon like you. Raghu says I respect you. Parag says we will not come. Raghu says she will come. Dhanak gets an idea. She takes lock and locks washroom with Mai inside. Mai says dont mess with me. Dhanak says you can remain in washroom now. Dhanak leaves with key. Raghu says to Mahindra that just bless us tonight. He leaves. Raghu says to Aslam that now we will distribute cards in chawl. Bai comes there and takes brick, she tries to break lock. Mai says its getting suffocated here. Bai breaks it and opens door. Mai says she is crossing all limits. Dhanak is going to her house. Raghu stops her and says today will be our wedding reception as you accepted our marriage, he gives her card. Dhanak tears it and throws it at his face. She leaves. Raghu smiles. Batli says dont worry. Raghu says she will come and sit in reception. Maya shows Mai reception card of Raghu and Dhanak. Bai says he is like Mai. Mai laughs. Maya says what? Mai says we will enjoy, they have blast in receptions but it will be a really blast for Dhanak, it will be fun. Mai prays. Mahindra wishes her for training. Dhanak leaves. Dhanak gets officer’s call. He says today is your wedding reception? take an off today, dont worry, congrats. Dhanak says who told you? Officer says your husband came to invite me but I cant come, we will meet tomorrow, he ends call. Raghu is arranging for reception. Dhanak stares at him and leaves. Dhanak comes to her room and says I wont spare him. Parag asks what happened? Dhanak says I am fine. Parag says I can see things, we have seen your IPS dream. Dhanak says he is doing all this so I attend reception but I wont. PRECAP- Mai says to Raghu that I dont accept this reception and neither will Dhanak come. Raghu says she will come. Dhanak comes there. Raghu drinks poison. Dhanak is stunned. 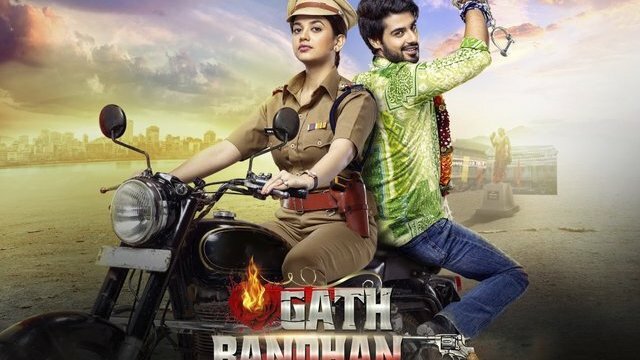 The post Gathbandhan 22nd February 2019 Written Episode Update: Raghu arranges his wedding reception appeared first on Telly Updates.